Over the past few years, Johnny's has developed and brought into the overall offering many different bed prep tools that boost efficiency for smaller-scale growers and home gardeners. The following is an overview of this group of tools, presented in the suggested order of use in preparing the bed. Every step listed below may not be necessary for a given situation, but if you are fortunate enough to have access to all or most of these tools, this is how we recommend using them. Aeration should always be the first step. 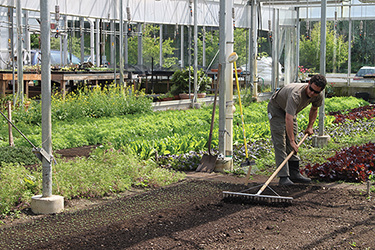 Loosening the soil can be efficiently and ergonomically accomplished with a broadfork. Aeration should always be the first step. These are deep-aerating tools designed long ago in Europe and subsequently redeveloped by Eliot Coleman and Johnny's. Our Broadforks are designed to deeply aerate while preserving soil structure and minimizing the surfacing of weed seeds. To use, the tool is driven in by foot, then pulled back just enough to crack the soil (about 45°), and pulled out. Repeat this action about every 8 inches or so, working backwards with the tool. Multiple sizes are available to match your strength and comfort level, and the task at hand. Available in traditional round tine design as well as our newer Hardpan Broadforks, designed for tougher soils. Next, you have to till, be it with one of these tools or a gas-powered tiller. 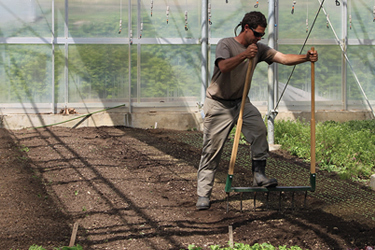 The Tillie is designed from the ground up to fit the needs of small-scale farmers & gardeners. This cleverly designed tiller is nothing short of revolutionary. It is the perfect stepping-stone tool for the small-scale farmer who is just starting out and working up to a walking tractor. A powerful hub motor drives this innovative and versatile tool which can be used not just to till, but to cultivate pathways, hill crops, and even efficiently form raised beds. Great for field work, and very convenient for high tunnels because it's completely easy to get in and out with it; and, with battery power, there are (of course) no fumes and it's very quiet. Plus, with a charged battery, you never have to worry if it's going to start. For all of its functions, the Tillie's speed and power depend on how far you engage the throttle, how fast you move, and how much resistance you provide. The Tillie V2 has an articulating tiller head, for cultivating between rows of plants in a bed while walking in the footpath, and a 36V 10Ahr Li-ion battery, which gives it more power and causes the blades to spin faster. Tilling with the Tillie is accomplished much differently from tilling with a standard rototiller or walking tractor. It is done by sweeping the Tillie back and forth in 5–6-foot arcs in front as the operator slowly steps forward. You can also use the Tillie to shape raised beds after initial tillage has been completed. To accomplish this, you walk along one footpath with the Tillie positioned over and across the bed, with the head positioned in what will become the next footpath, but held at a 45-degree angle forward of the operator. Lines of twine can be suspended as shown in the photo, as guides, for keeping rows straight and bed widths consistent. This usually takes no more than one or maybe two passes, depending on the soil. Incorporating amendments and improving "tilth," or the "crumb" of your soil, may be an appropriate step, depending on your situation. Incorporating amendments and improving tilth may be an optional step, depending on your situation. 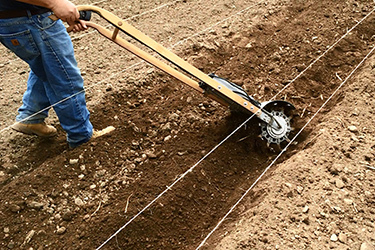 This is a lightweight tiller, powered by your rechargeable drill, and designed to create perfect tilth within the top 2 inches of your bed by mixing in compost and fertilizer while chopping up the roots of the previous crop. The Tilther was conceptualized by Eliot Coleman and is used extensively on his farm. If you have one of these on hand, it is very convenient now (early spring) to make one pass down each side of the bed top to really work up the soil in that top layer and incorporate any amendments you will be using. It is more efficient to do this now than during initial tillage, because you will use far less quantity of amendments, allocating them only to where the crops will grow and not the footpaths. Smoothing and leveling the bed top helps assure successful seeding. The Bed Preparation Rake can also be fitted with Row Markers. At this point, the bed top is raked smooth to create a perfect seedbed for successful precision planting. 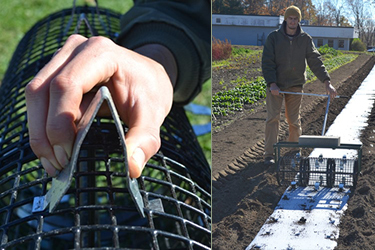 The Bed Prep Rake is a perfect tool for that — an excellent companion to precision seeders. This Eliot Coleman favorite is so light, the user can support its entire weight even when fully extended. Its Swiss aluminum head is 29 inches wide, with 20 curved, 4-inch-long teeth that grab stones and debris when pulled, then level and smooth when pushed. Its 6-foot handle allows the user to reach way out, but still "float" the rake to achieve a nice, flat bed top. If you are transplanting, you might skip this step, or skip the step above with the Tilther. 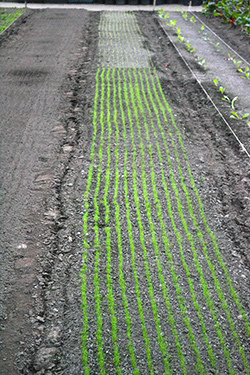 Firming the bed beforehand is highly recommended when seeding with the Four-Row Seeder or Six-Row Seeder . 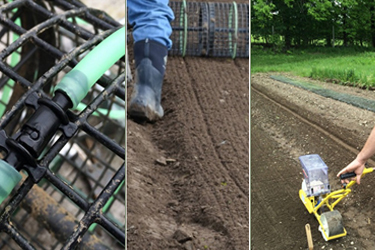 The perfect complement to precision seeders and mechanical harvesters, Johnny's Seedbed Roller is fitted with heavy-duty, 1-inch lobster trap wire mesh spaced close enough to break up smaller clumps and dirt clods but wide enough to resist getting clogged with soil and mud. The rollers can also be used post-seeding to press seed firmly into contact with the soil for improved germination rates. May be pulled or pushed. Handle is adjustable laterally to allow operation in-row or from either footpath. A metal rack on top can accept additional weight if needed. We've got dibbles for that. Useful for open-soil transplanting as well as for puncturing through plastic mulch. Available in three sizes and easily interchangeable, the Snap-in Dibbles allow for many combinations of plant spacings, with perfect spacing every time. 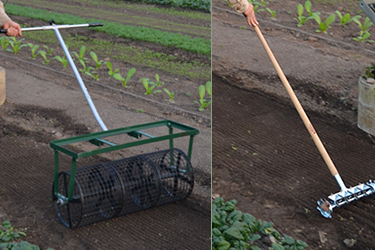 The Seedbed Roller's 1-inch mesh and 36-inch circumference make dibble arrangement simple and intuitive. No special tools required; just squeeze, and they snap right in, securely gripping the coated trap wire mesh from both inside and out. Change-out for new setups is fast and easy. They work as well through plastic mulch as they do in open soil (sometimes better due to moisture level). 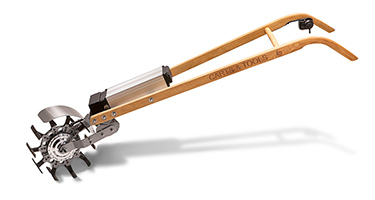 Depending on soil conditions, additional weight may be necessary for full dibble penetration; in that case, the roller is more easily pulled than pushed. Direct-Seeding with an Earthway Seeder or Single-row Jang Seeder? Efficiently mark rows for seeding with a single-row seeder. We've got Row Markers for that. The Seedbed Roller's 1-inch mesh makes arrangement of the Row Markers easy, allowing you to mark perfectly-spaced rows for seeding while you roll the bed. 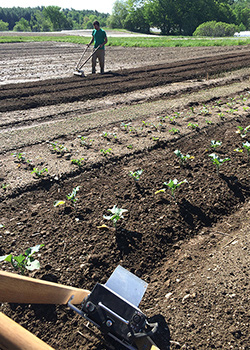 The Row Markers are fashioned of 5/16-inch polyethylene tubing with plastic quick disconnects that quickly install around the Seedbed Roller to mark rows for seeding with a single-row seeder. Some minor assembly required. This is basically a short-form version of the procedure above. In preparing existing beds for mid-season succession plantings, tilling is typically not necessary, but aeration with a Broadfork is definitely a good idea. If you have raised beds, they may need to be reformed if they have settled a lot due to weather, etc. The Tillie is a great tool for that. The rest of the bed prep elements above fall into line next as you prepare the bed — use the Tilther to fluff and even the bed top and incorporate any needed amendments, the Bed Prep Rake to level and smooth, the Seedbed Roller to firm, Dibbles and Row Markers if necessary, and so forth. This hand-pulled device makes laying plastic mulch on the soil faster and easier. Unless you have a tractor-mounted mulch layer, this step can be a labor-intensive process. Here is an alternative solution — a brand new product that is "people-powered." 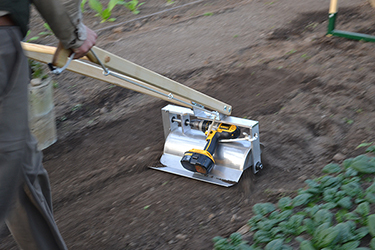 Quickly and efficiently lay mulch by hand with this manually operated device. Fully adjustable for a wide variety of bed widths and mulch sizes, this hand-powered mulch layer is a real game-changer. 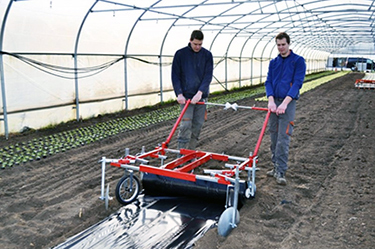 Designed for maneuverability, it can be easily used in greenhouses, high tunnels, or areas where field space is limited. The Manual Mulch Layer can also concurrently lay single or multiple lines of drip tape; for precise placement, optional Drip Tape Collar Stops are recommended. Accommodates 36–60-inch mulch widths. Weighs 97 pounds, and some assembly is required. Laying mulch with this tool is a two-person operation. For added convenience, optional Transport Wheels are also available.